I challenge you to our “3 game ideas in 3 days” with a twist. Our challenge started off as part of our Planning Phase Checklist. But today I wanted to make it a bit more challenging. You can plan out your 3 games by following along with what I have written out. Or you can grab a nice looking copy of our Planning Phase Checklist here. Thanks to Elly for making it look so good! If you want to see how I did the challenge then watch this short video and then read about the 3 games I came up with below. In case you can’t see the video right now then it’s ok.
All you need to do is roll a D20 3 times to see which 3 of these 20 board game types you will be challenged to think of. Then plan out your 3 games using your Planning Phase Checklist. Here are the 3 games I planned after rolling for my 3 game types. **Note – It’s best to re-roll for the “Print & Play” game type and for any duplicates you may roll (like I did). Target Audience – Trading card game (tcg) players. Backstory – I used to play a lot of Mech Warrior 2 growing up on the computer. And this genre (theme) seems to fit well with my target audience. I wanted to keep the player count down to 3 people because I feel that deck building games tend to get boring with a lot of people. The original number I had was 2-5 but then realized that I don’t even usually like to play when there are 4 or more players. And when you make games you should aim towards making a game that YOU would want to play. 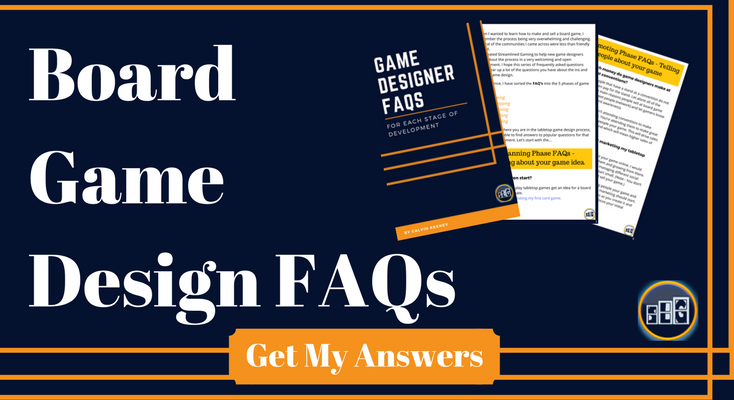 This will lead to you having more fun designing the game and playtesting it which then leads to a better game for your players. Goal(s) – To assemble the best performing multiplayer online battle arena (MOBA) team. Think of video games like League of Legends and DOTA 2. Except this is a card game where you draft players for each role on your team. Theme – MOBA. This could have just as easily have been called “Basketball Manager” with a basketball theme. But I don’t think that fits as well for an audience that enjoys card games (and I like the MOBA theme better anyways). Target Audience – Casual MOBA players that also like board games. Basically the same target audience that Mechs vs. Minions has. Backstory – I used to play fantasy football every season. Though I haven’t ever played fantasy League of Legends or anything I’m sure it’s fun. I think it would be cool to have a drafting game where you draft your players and then actually “play” against each other. For example, you would draft your team (deck) and then match them up against another player and see who wins. There would be some dice rolling and what not mixed in to add to the excitement. This is good to have in a game. Especially one that is aimed at casual players. Drafting games are really good at handling a large amount of players. This game in particular would be fun to have a lot of players with each one representing a team from a popular MOBA game. I don’t know if I would actually end up needing a board for this game. But if I did I think a small/medium sized one would work. I see a lot of the popular drafting games use a board these days to help players visualize where all the different decks of cards go. So I would probably want to have one board in the middle or have smaller individual “team” boards that players pick at the beginning of the game. Some teams would start with less money to draft but would have a higher fan base. The higher fan base would make your players perform better after you drafted them and started playing head to head matches against other teams. Goal(s) – Have the most “spell points” by graduation (end of the game). Theme – At this university you play as a mage trying to learn the best set of spells to graduate at the top of your class. Backstory – I really like when games encourage players to experiment a lot and I think this game would do just that. Often times I find myself pretending to be a wizard or mage which is why I want to play the Harry Potter deck building game. So with this game I would be trying to help families be creative together in learning new spells at the University of High Castle. This was by far the most difficult game type for me to think of. It might just be that I love drafting and deck building games so much that they are kind of natural for me to think of now. But I think worker placement games are just more in depth in general. Making them harder to plan out. Again I’m not sure that this sized board is needed but I know I will need one for this type of game. And it will probably need to be big (like the board I chose). A lot of worker placement games have some type of money piece but I went with wit counters for my “currency”. It fits the theme really well and I think it would be fun to role play gathering up wit to complete awesome spells. This is a great exercise to help you think more creatively. I like doing these types of challenges a lot because it works out my brain. A lot of people think of exercise as only being physical but I like to focus on improving my mind as well as my body. When you are in great mental and physical shape then you will make better games. So I encourage you to take the challenge. Even if you already have a game in progress you should take some time out to brainstorm new ideas because it gets your creative thoughts flowing. I’m not saying to give up on your current game but just to expand your mind. To not get stuck. And if you want to do this challenge using our nice looking checklist, then get your copy by clicking here and telling us where to send it.